What defines bulbs and tubers? Bulbs: A bulb is a short stem with fleshy leaves or leaf bases. The leaves often function as food storage organs during dormancy. A bulb’s leaf bases, known as scales, generally do not support leaves, but contain food reserves to enable the plant to survive adverse conditions. At the center of the bulb is a vegetative growing point or an unexpanded flowering shoot. The base is formed by a stem and plant growth occurs from this basal plate. Roots emerge from the underside of the base and new stems and leaves from the upper side. Tubers: Tubers are various types of modified plant structures that are enlarged to store nutrients. They are used by plants to survive the winter or dry months and provide energy and nutrients for re-growth during the next growing season, and they are a means of asexual reproduction. There are both stem and root tubers. A stem tuber forms from thickened rhizomes or stolons. The tops or sides of the tuber produce shoots that grow into typical stems and leaves and the under sides produce roots. A tuberous root, or storage root, is a modified lateral root enlarged to function as a storage organ. An amaryllis is a true bulb, like an onion, consisting of multiple encircling leaf bases which make up the bulb. The larger the bulb, the faster it will bloom and the larger the blooms. A bulb smaller than two inches will not bloom, but once of flowering size, an Amaryllis bulb can produce flowers up to 75 years. The word amaryllis comes from the Greek word amaryssein which means to sparkle, referring to the bloom. It is also references the tale of the Greek maiden named Amaryllis, who created a red bloom for her true love from her own blood. Amaryllis was a shepherdess who loved Alteo, a shepherd with Hercules’ strength and Apollo’s beauty. However, Alteo only loved flowers. He’d often said that he would only love a girl who bought him a new flower. So, Amaryllis dressed in maiden’s white and appeared at Alteo’s door for 30 nights, each time piercing her heart with a golden arrow. When Alteo finally opened his door, he found a crimson flower, sprung from the blood of Amaryllis’s heart. Amaryllis is a monotypic genus (only one species) containing the Belladonna lily, Amaryllis belladonna, a native to the southwestern Cape of South Africa. It is often confused with Hippeastrum, which is commonly sold for indoor blooming. The confusion surrounds the scientific name, Hippeastrum, and the common name, amaryllis. Hippeastrum is known worldwide as amaryllis and is composed of several species, unlike Amaryllis. Hippeastrum has 4-6 large flowers on a hollow stem and Amaryllis belladonna has 2-12 smaller flowers on solid stems. Amaryllis ignea, currently known as Phycella ignea. 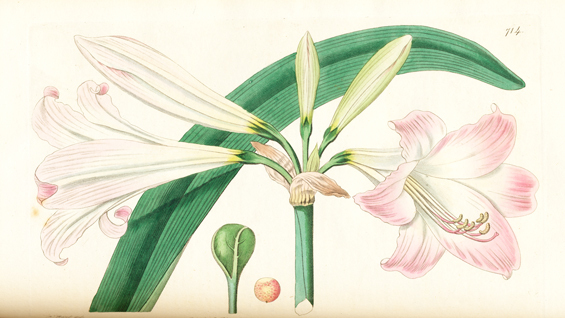 Image source Botanical Register Vol. X (10: plate 809. 1824). The specific epithet belladonna means beautiful lady. Amaryllis belladonna has many common names. For example, in the United Kingdom it is known as the belladonna or Jersey Lily. In South Africa it is known as the March Lily. Here, the flower is referred to as the Naked Lady owing to the fact that the flower appears without leaves. Amaryllis belladonna has also been called St. Joseph’s Staff in Portugal, St. Rosalina in Sicily, and the Madonna Lily in Italy. Within the country of Spain one might hear it referred to as ‘Meninas Para Escola’, meaning ‘girls going to school’ because they bloom at the beginning of the school year, when girls in pink uniforms start attending classes. The bulb produces one or two naked stems, each of which bear a cluster of 2-12 trumpet-shaped, fragrant flowers ranging from white, pink or purple in color. The leaves remain green throughout the winter period. In summer, the leaves die back and the bulb becomes dormant. This strange phenomenon of flowering before the leaves appear is known as hysteranthy. It is always a special treat at the Arboretum to see these showy bulbs bloom along the road west of the Bauer Lawn. They herald the end of summer and the beginning of autumn. Haemanthus coccineus, whose common names are the “blood flower” or “paintbrush lily”, is a bulbous geophyte native to southern Africa. 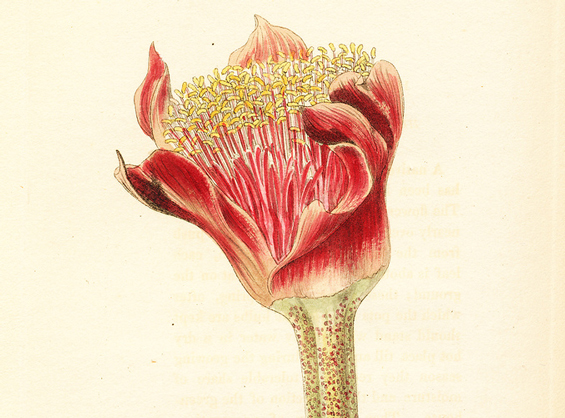 Haemanthus coccineus. 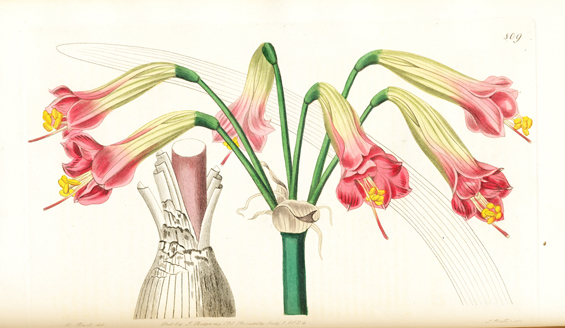 Image source: The Botanical Cabinet by Conrad Loddiges (& Sons). (1818-1833) Vol III (3). Plate 240. The image is cropped. The generic name Haemanthus is derived from the Greek words haima for blood and anthos for flower; coccineus is the Latin word for red or scarlet. In the Afrikaans language it is known as Bergajuin, Bloedblom, and many other vernacular names. The paintbrush lily is widespread throughout the winter rainfall region in southern Africa including the southern parts of Namibia, to South Africa in the Cape Peninsula, to the Keiskamma River in the Eastern Cape. It is found in Renosterveld and Fynbos habitats. It can be found in clumps of hundreds, under the shelter of other shrubs on flat land or shady ravines and rock crevices. 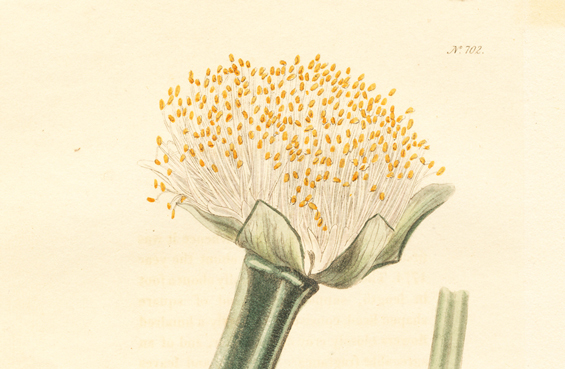 Haemanthus puescens. Image source: Loddiges’ Botanical Cabinet by Conrad Loddiges (& Sons). (1818-1833) Vol VIII (8). Plate 702. The image is cropped. The flowerheads of Haemanthus coccineus emerge between February and April, with scarlet spathe valves like bright shaving brushes, making it a very striking plant. The flowers are soon followed by translucent, fleshy berries. There are usually two large leaves per bulb and occasionally three, which appear after flowering. The brilliant flowerheads account for its early appearance in Europe, having been described by Carl Linnaeus in 1762. Together with Haemanthus sanguineus, this was the first Haemanthus to be introduced to European horticulture as an ornamental plant. At the Arboretum, as the Amaryllis belladonna heralds a change of seasons, so, too, does the appearance of the spectacular flowers of the paintbrush lily.